It comes as a surprise to no one that North Korea’s newly concluded 7th Party Congress was more “show” than “tell,” but the gathering succeeded as a platform for Kim Jong Un to cement his leadership legitimacy and broad policy for governing. By pulling off the event without a hitch and taking the microphone for two long speeches, Kim signaled that he is in charge, even if there is ample room to doubt the sincerity and feasibility of his ideas for implementing his showcase byungjin policy. While much of the press coverage of the Congress focused on North Korea’s unyielding commitment to its nuclear program and ambitions to becoming a responsible and acknowledged nuclear state, the media also devoted significant attention to the country’s announcement of its first five-year economic development plan since the 1980s. For observers who hoped to see the unveiling of significant new economic policies or reform initiatives, however, the plan’s announcement offered only thin gruel. The regime revealed few details about the five-year strategy. Perhaps most conspicuously, it made no mention of a role for existing or potential domestic markets in meeting national economic development goals, consistent with high-level economic statements that the DPRK has issued since the beginning of the Kim Jong Un era, and avoided acknowledging any impact that international sanctions may have had on the North’s economy. With these omissions in mind, we can consider what Kim Jong Un did say in his speeches, and what his remarks might imply about North Korea’s new priorities and policy directions, openings for future economic engagement and potential hooks for the international community to grasp in any future negotiations. North Korea’s adoption of the formal five-year economic development plan is itself a significant feat that required disciplined technocratic preparation and careful formulation for political acceptability. With announcement of the plan, Kim Jong Un established his commitment to economic development as a cornerstone for his legitimacy, providing North Korea’s most objective scorecard in decades for measuring the performance of one of its leaders. The regime may have signaled an important change on the last day of the Party Congress by appointing Pak Pong Ju, Premier of the Cabinet, as a new standing member of the Workers’ Party of Korea (WPK) Political Bureau. This move appears aimed at strengthening ties between key overseers of the economy. Kim Jong Un has consistently emphasized the Cabinet’s lead role in developing a national economic development strategy and supervising its implementation, and by naming Pak to the WPK’s top leadership body, the supreme leader gave the Cabinet an economic voice at the senior political level. Pak’s position could empower the Cabinet to execute the new plan with the support of the WPK’s national political apparatus. This alignment may be relevant for pursuing a range of economic development goals, but it will be essential if the five-year plan ultimately embraces an acknowledged role for markets in its implementation, similar to policies adopted in China and Vietnam. The specifics of the plan remain largely undisclosed, but Kim offered a crucial insight into the rationale behind the goals: “It is necessary to further increase the might of the politico-ideological power and military power.” By asserting that economic development is essential for the country’s strength, Kim’s wording goes beyond his oft-repeated pledge to improve the livelihoods of ordinary North Koreans and establishes a new formulation of the economy’s relationship to regime stability and national defense. The remark can be seen as part of Kim’s ongoing break with his father’s “military-first” politics: in the opinion of the current government, it is growing harder to sustain guns without butter. Kim’s language tacitly recognizes that as sanctions increasingly target economic resources that directly support North Korea’s armed forces, the military can no longer operate a viable parallel economic system comprised of its own foreign exchange-earning enterprises, trading companies and banks. As such, his words suggest that it is preferable to build a resilient and dynamic “people’s economy” and pass income to the military through the budget process. To pursue this economic vision, Kim Jong Un said that “It is necessary to expand and develop external economic relations.” endorsement of integrating an outward-oriented component of the economic development strategy may appear inconsistent with Juche ideology, but it is a realistic response to North Korea’s need for foreign exchange to develop its economy, support its military and extend patronage to its elite. However, Kim’s uncertain ability to reconcile this goal with increasing sanctions pressure casts doubt on the credibility of his byungjin policy. Moreover, it highlights vulnerabilities in key economic interests that foreign partners may be able to exploit in eventual political negotiations. While his stated priorities of developing the energy, agriculture and light industry sectors are not new on a superficial level, each area is a potential avenue for the international community to address North Korea’s interests in light of the greater linkage that the country now perceives between those interests and its economic future. For energy, Kim’s specific references to greater use of domestic sources such as coal and nuclear power reflect a recognition of North Korea’s continuing dependence on imported sources of energy. With coal exports to China expected to decline because of the recent UN Security Council Resolution 2270 and a growing Chinese focus on climate change and pollution challenges, it is a rational economic response for the North to increase its domestic use of coal for power production and other manufacturing uses. North Korea has also integrated peaceful atomic power production into its nuclear commitment under the byungjin policy, providing one potential hook for negotiations on its nuclear future that trades North Korean concessions on the nuclear weapons program with support for building a safe nuclear power capability. Agricultural output has improved somewhat in recent years—partly as a result of limited reforms—and Kim Jong Un understandably has framed this uptick within a positive economic narrative and promised further improvements. In referring to the mechanization of agriculture, he recognized that productivity improvements will require an infusion of investment in equipment, not merely the economic incentives offered to individuals under the government’s earlier decisions to permit smaller production units and retention of larger shares of production yields for sale or personal use. Finances for this kind of economic development investment may offer another hook for future dealings with North Korea and economic benefits that could be discussed in a political negotiation. North Korea has for years promoted the development of light industry as a job producer and a means to reduce imports of consumer goods from China in favor of domestic products. This emphasis is consistent with its Juche policy of national self-reliance and import substitution, and the focus has gained additional relevance in today’s environment of increased sanctions. What is interesting to note is Kim Jong Un’s reference to the need for modernizing industry. His remarks on the matter reflect a long-standing theme that productivity improvements must rely on science and technology. But they also reflect recognition of the need for improved business management and implicit acknowledgement that state enterprises increasingly operate in a more complex environment where they must contend with the reality of markets and higher-wage market opportunities for workers. The 7th Party Congress provides important clues for foreign governments on how economic issues might fit into future broader security and political negotiations with North Korea and its leadership. While details of the country’s new five-year economic development plan have yet to emerge, there appears to be ample scope to reconsider the possible economic dynamics of the North’s path forward. Careful assessment can and should influence decisions in Washington, Seoul, Tokyo, Moscow and Beijing about future engagement policies. 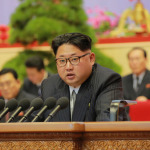 For English-language translations of Kim’s remarks, see “Kim Jong Un’s Speeches at the 7th Workers’ Party Congress,” Korean Central News Agency, May 6-9, 2016” (Washington, D.C.: National Committee on North Korea, 2016), http://www.ncnk.org/resources/news-items/kim-jong-uns-speeches-and-public-statements-1/KJU_Speeches_7th_Congress.pdf. Anna Fifield, “North Korea announces five-year economic plan, its first since the 1980s,” Washington Post, May 8, 2016, https://www.washingtonpost.com/world/north-korea-announces-economic-plan-after-unprecedentedly-grim-struggle/2016/05/08/c84088e2-1214-11e6-a9b5-bf703a5a7191_story.html. “We will work out the phased strategy for the national economic development in a scientific and realistic manner and carry it out without fail and carry through the five-year strategy for the state economic development from 2016 to 2020 for the present.” “Decision of Seventh Congress of WPK Adopted,” KCNA, May 9, 2016. Whan-woo Yi, “NK leader named chairman of the Workers’ Party,” Korea Times, May 9, 2016, http://www.koreatimes.co.kr/www/news/nation/2016/05/485_204361.html. “Kim Jung Un sets forth tasks for completing socialist cause,” KCNA, May 7, 2016. See also, Eric Talmadge, “Kim Jong Un says North Korea Won’t Use Nuclear Weapons First,” Associated Press, May 8, 2016, http://www.theblaze.com/stories/2016/05/08/kim-jong-un-says-north-korea-wont-use-nuclear-weapons-first/. These areas reflect basic underlying challenges for the domestic economy, and each has received attention in recent New Year’s statements. Eric Talmadge, “Kim Jong Il says North Korea won’t use nuclear weapons first,” The Associated Press, May 8, 2016. A good summary of the policy and its implications is Seong-Whun Cheon, “The Kim Jong Un Regime’s ‘Byungjin’ (Parallel Development) Policy of Economy and Nuclear Weapons and the April 1 ‘Nuclearization Law,’” Online Series CO 13-11, Korea Institute for Korean Unification, April 23, 2013, http://www.kinu.or.kr/upload/neoboard/ DATA01/co13-11(E).pdf. While the UN Food and Agriculture Organization recently reported a downturn in grain output in 2015 due to unfavorable weather conditions, the underlying trend is positive and likely to continue, as discussed in a recent 38 North article. See Randall Ireson, “Why Headlines About DPRK Agricultural Production Miss the Point, 38 North, May 6, 2016, https://www.38north.org/2016/05/ireson050616/. James Pearson, “North Korean Leader Kim sets five-year economic plan, vows nuclear restraint,” Reuters, May 8, 2016. “Technical updating and the work for ensuring the local supply of raw and other materials has been positively conducted in factories and enterprises in the field of light industry to ensure increased production and supply of quality consumer goods for people,” Korean Central News Agency, “Kim Jong Un’s Speeches at the 7th Workers’ Party Congress,” 16.